Certainly one of the most unusual, debatably beautiful and easiest of the Amorphophallus species to grow for beginner. Alternatively known as ‘Devils Tongue’ this interesting Aroid is worthy of place in any conservatory or mild climate. As with many Amorphophallus species the petiole pattern can be highly variable on bulbifer. The petiole is topped by a very ornamental divided leaf. To add to the excitement of this plant each leaf is edged with pink! 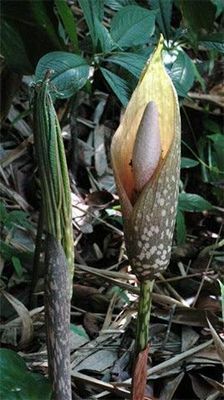 The spathe is 10 to 15 cm long in shades of pink with green and brownish blotches. The standard size tubers being offered will produce foliage upto 1 meter tall.